The following is an announcement by Dr Sharique Zafar of the Holistic Health Care and Research Organisation in India. 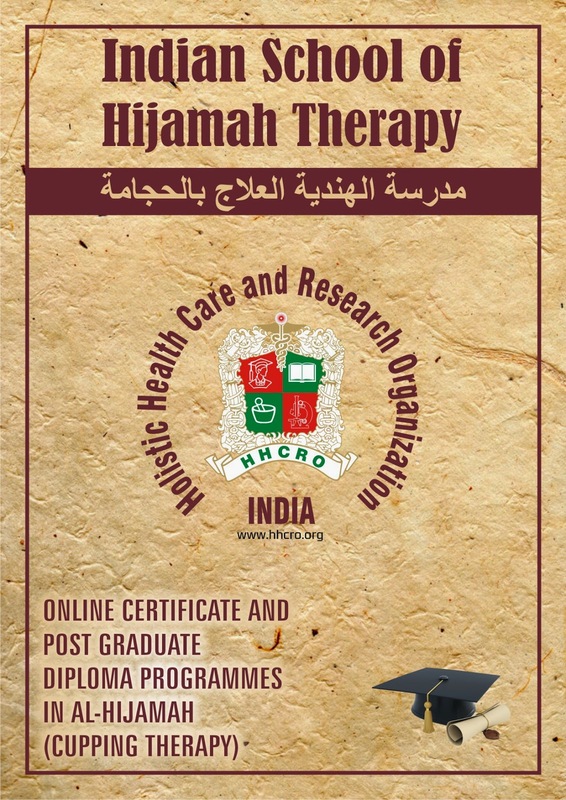 established Indian School of Hijamah Therapy (ISHT) to impart education on Hijamah Therapy through online Certificate and Diploma Courses which are designed separately for Therapists and Doctors of traditional medical systems of the world. We welcome people from all parts of the world to enroll in our programs on hijamah therapy, which is the most effective therapy of the world. These courses are suitable for part time distance learning with flexible teaching schedule and self-study syllabus in the comfort of your home. We can proudly claim that as compared with any such courses available on cupping therapy internationally; our courses are inclusive of maximum quality contents and hours of live practical training at our centres at Mumbai city, India.Courses of ISHT meet educational standards in line with guidelines for the practice of cupping therapy followed in different countries. These courses are inclusive of one year membership of HHCRO. Online for six months, in English, and syllabus includes full technical details on hijamah therapy and these therapists will be made efficient to practice hijamah under medical supervision. All lessons will be sent online. It is mandatory for every student to attend organizations’ clinics for one week as per the allotted days for practical training mutually decided as per student’s availability. Final examination will be held at the end of the course with physical presence at our centres. Fee for the Certificate course is Rs. 30,000/- for Indian and $ 1500 for overseas students. Online course in English is for AYUSH doctors of India having graduation in respective fields, or graduates of traditional systems of medicine from other countries possessing equal recognized qualifications. Syllabus includes full technical details of hijamah therapy and treatment of ailments by it. All lessons will be sent online. It is mandatory for every student to attend organizations’ clinics for two weeks as per the allotted days for practical training mutually decided as per student’s availability. Final examination will be held at the end of the course with physical presence at our centres. Fee for the Diploma course is Rs.70,000/- for Indian and $ 3500 for overseas students. ng difficulty in transferring this way will be given alternate options. After getting prospectus, fill in your application form and send it back to the given emails. Once your application is received you may be required to provide supplementary information that will be requested via email. Your application will be reviewed and if approved by the committee, you will be given instructions for admission and how to make your deposit of fees. For that purpose directions will be given to pay fees of the course accordingly. All courses will be uploaded on our website (www.hhcro.org) soon. Before that, all interested individuals may contact to the President / Secretary of the HHCRO on email. I have done diploma in OPTOMETRY and currently doing my degree in the same. Everything is clarified you just give positive response on our email for your joining of Certificate course. I am interested in certified course of Al hijama for therapist. Kindly send me the full details of the course and payment method as I would like to pay my fee in two installments. I want to know more about the certified course on Hijama Therapy. I live in mumbai and keen to join and learn the sunnah. I am a pharmacist (B pharma), is it eligible for me to do a certificate course in hijama therapy, n practice in the related field…..? I want detail information about pg diploma course..